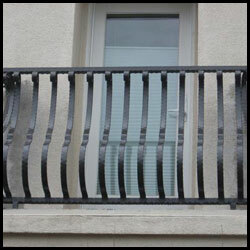 Our wrought iron balconies in San Francisco are top of the line and fabricated in our wrought iron shop. When you purchase a wrought iron balcony from our San Francisco Iron Company you will get a product that has been manufactured following the highest standards in the wrought iron industry. All of our wrought iron balconies are designed in house and we will personally come out and install them with our full service wrought iron certified installation team. Our wrought Iron Balconies are custom built to your specifications. Our designs range from basic to the most detailed and intricate. We can custom design a balcony to meet your structural and aesthetical specifications. We can work with you or your designers to fabricate a style that suits your residential home or estate. Iron railings work great for balconies because they function as a design element and an effective barrier at the same time. If you are planning to use something like this on your balcony, you must be sure to get a strong set of rails to ensure your safety. The posts on the corners must be thick and well secured to the deck to provide maximum support in case someone leans over the edge. If you have small children, you also need to be cautious of how big the openings are between the rails. You do not want them to get their heads caught in the railing. You can use iron for indoor and outdoor balconies if you want. The indoor ones do not need to be quite as tough because they will not be exposed to high winds and other elements that may compromise their integrity. If you have an indoor balcony, consider working the iron into the stairs as well for an even flow throughout the house.